Brazil, according to a long-standing joke, is the country of the future and always will be. Founded by a mixture of Portuguese explorers and colonists, indigenous peoples, and European and African immigrants, Latin America’s largest country boasts a population of 200 million and a GDP that eclipsed that of the UK in 2011. The country’s banking infrastructure reflects both its rapid rise in recent years and its historic status as an emerging market. Even after nearly two decades of economic expansion under Fernando Henrique Cardoso (1995-2003) and Luiz Inácio Lula da Silva (2003-2011), the percentage of Brazilians who do not use banking services is still close to 40% according to economic think tank IPEA, and 55% of employees in Brazil are paid in cash according to research from the Brazilian Central Bank. In total, regional bank Banco Panamericano estimates that there are at least 75 million people with no access to banking services in Brazil. Nevertheless, Latin America’s largest nation harbours grand ambitions for the near future. It will host the FIFA World Cup in 2014 – a major project, and one for which several new football stadiums have been constructed, including one in the north-eastern city of Salvador that was recently damaged by heavy rainfall, and another in Rio de Janeiro that has been totally rebuilt for the event. It is also hosting the 2016 Olympics. These events will focus international attention on Brazil – and provide an opportunity to showcase the country’s latent economic potential. In May, Brazil got its first mobile payment service when MasterCard combined with Spanish and Latin American operator Telefónica to debut its Zuum service in Sao Paulo and Belo Horizonte. Zuum will allow Brazilians to transfer money, buy credits for pre-paid mobile phones and pay bills with their mobile phone. The service aims to capitalise on the fact that there are over 267.5 million mobile phone subscriptions in the country, according to figures provided by the World Cellular Information Service – making Zuum potentially an ideal tool to reach millions of people who do not have a bank account, but do have a mobile phone. Other mobile payment services are also expected in Brazil imminently. Zong, a PayPal subsidiary started in 2008 by entrepreneur David Marcus, is currently seeking to bring Brazilian carriers Vivo, TIM, BRT, Claro and Oi onboard for its own mobile payment service in the country. Meanwhile, eFinance company Paggo is developing payment solutions with mobile operator Oi and the national bank, Banco do Brasil. In the capital markets, Brazil has attracted vast amounts of trading technology and foreign investment in recent years. Based in Sao Paulo, BM&F Bovespa is the stock exchange and derivatives market for Brazil. It is by far the largest exchange in Latin America, soaking up an estimated 80% of Latin American flows according to Thomson Reuters, and second only to the CME Group in the whole of the Americas, if NYSE Euronext’s European activities are discounted. The exchange is widely known for its efforts to encourage participation of foreign investors and build up its technology base, including the construction of four different DMA segments and co-location facilities that appeal to high-frequency traders and other sophisticated institutional participants. BM&F Bovespa rolled out its new Puma trading system in equities only last month, as well as a new market surveillance system from Nasdaq OMX in April. According to the Long Finance Global Financial Centres Index compiled in March, Sao Paulo is now the highest rated financial centre in Latin America, ranking number 44 globally. 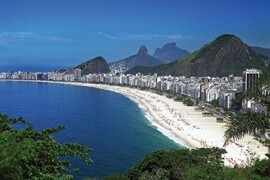 Rio de Janeiro is number 48; both rankings have increased since the previous year by four places each. Notably, Brazil is behind China’s Shanghai (number 24) but ahead of Moscow (number 65) and Mumbai (number 66). In addition, China’s top city fell five places versus the previous year while Brazil gained ground. “In Latin America, financial centres in Brazil made good ground in GFCI 13 and are likely to rise further,” says the GFCI report. Meanwhile, the removal of a stamp tax in Brazil late last year has prompted a significant uptick in liquidity; last year in Brazil, for the first time according to research house Aite, Europe surpassed the US as a driver of foreign trading volumes in Brazil. In May, BM&F Bovespa joined the BT Radianz Cloud, a financial community that connects 500 member locations in Latin America with BT’s global network. BM&F Bovespa has also long held an alliance with CME Group in the US, which allows order routing between the two venues, effectively making it easier for US investors to access the Brazilian market and vice versa. One potential fly in the ointment is the lack of exchange competition. According to Bill Ruvo, head of Elektron managed services Americas at Thomson Reuters, BM&F Bovespa’s ownership of the settlement and clearing infrastructure for Brazil presents a major challenge to any would-be competitors, since these would have to either establish their own post-trade infrastructure or risk undermining their own business models by using the clearing provided by the incumbent exchange. Both US exchanges Direct Edge and BATS have expressed interest in entering the Brazil market, as has Americas Trading Group, yet none of these would-be players has yet committed to a launch. However, Salvador Palma, managing director at XP Securities in New York, formerly president at Latin America capital markets specialist Alyar, argues that in the longer-term, the prospects for Brazil remain positive. Pointing to the role of the country’s strong regulation in protecting Brazil from the financial crisis, and the wisdom of the country’s tough controls such as its ban on so-called “naked access”, in which asset managers access the market using their broker ID with no pre-trade risk controls, he added that Brazil remains a stable, powerful and attractive market. Other centres in Latin America have also made notable progress over the last year. In the GFCI study, one of the star performers was Buenos Aires in Argentina, which jumped 15 places to number 53 – a dramatic improvement on its position a year earlier. Panama made its debut on the index this year, entering at number 67. The rankings were decided based on business environment including the rule of law and low corruption, the demographic base, simplicity and stability of taxation, reputation and predictability, strength of infrastructure and ease of market access. In Mexico (number 55), a strong IPO pipeline has helped to create a robust market for investors, while at the same time new trading technology has brought an order of magnitude improvement in the exchange response times, creating much reduced latency for all participants. According to Carlos Hernandez, head of trading technology at Mexican broker Interacciones Casa de Bolsa, reliability at the Mexican exchange has experienced a major step up from the previous trading system following an upgrade earlier this year. These improvements are helping to foster a cultural change, as participants learn to adjust to the arrival of sophisticated new kinds of participants and new kinds of venue, such as the dark pool launched by the Mexican exchange in September last year. Meanwhile, Latin America’s other smaller markets have also been active. In January, Peru’s Lima Stock Exchange signed a deal with the London Stock Exchange to obtain trading and smart order routing technology. The Lima exchange is one of the founding members of MILA, the Mercado Integrado Latino Americano, a regional project between Colombia, Chile and Peru that aims to link the three stock exchanges with shared order routing and market access, boosting domestic demand and international participation. On MILA, the exchanges of the three countries agreed to open up to each other’s members – meaning for example that an investor in Santiago, Chile can trade on the Lima exchange even if that investor only has a licence for his local Santiago exchange, and vice-versa. Mexico is also due to join the group before the end of this year, following the signing of an agreement to that effect in late 2011. According to Palma at XP Securities, the addition of Mexico to MILA would provide a useful boost to the project, since the three existing members have relatively underdeveloped futures markets. Mexico’s MexDer would bring a stronger presence in a new asset class to the group, making for a more compelling proposition. Nevertheless, he is favourable about the existing line-up’s achievements. Palma added that the economic fortunes of different Latin American markets can be traced back closely to government decisions. In Argentina, for example, he observes that the government has been stifling the country’s strong potential by controlling exchange rates, bank lending and even nationalising pensions. However, he is much more optimistic about Colombia. It is not just exchanges adapting more modern trading technology, either. Later in January, Chilean broker Banchile, part of Santiago-based Banco de Chile, deployed a brokerage platform from UK systems supplier Fidessa that hooked it up to international trading venues. Palma notes that regional brokers have been investing heavily in direct market access technologies, while technology and connectivity vendors such as SunGard and Fidessa are active in several Latin American markets. Banchile operates both as a broker and as an asset manager, through its Banchile Corredores de Bolsa and Banchile Administradora General de Fondos businesses respectively, and has approximately $9.5 billion assets under management. The technology Banchile bought from Fidessa consists of a brokerage trading platform including an order management system and algorithmic and basket trading tools. It also includes connectivity to Fidessa’s global network, which gave the broker access to 3,200 buy-side firms and 180 trading venues around the world. “We are seeing a lot of activity in the Andean region with firms replacing legacy vendor and proprietary systems and investing in customisable, high-throughput, low-latency trading solutions to enable high-quality execution, greater operating efficiency and a solid basis for growth,” said Alice Botis, head of business development for Fidessa in Latin America. Fidessa opened a new office in Sao Paulo late last year; the company is currently building out its Latin America team, and Botis is confident that the regional will continue to see further expansion as local traders move from exchange terminals to more sophisticated systems and as algorithms and basket trading strategies continue to grow in complexity. Despite this enviable growth, the man on the street in Sao Paulo, Santiago or Lima is still not necessarily receiving the most effective, efficient banking service possible. According to Palma at XP Securities, banks have been making enormous profits at the expense of consumers who may be buying a car for the first time, or purchasing household appliances that would be out of their reach without a supply of credit. However, he believes that this situation is already beginning to change, as micro-credit organisations spring up across the region offering customers better rates and gradually pushing spreads down. In 1951, Ernesto ‘Che’ Guevara set out on his famed motorcycle journey across South America and witnessed the poverty and inequality that inspired his later revolutionary struggle in Cuba. Some 62 years later, Latin America is still not an equal society. But rising GDP, stable government, advancing technology and growing competitive forces are now pushing forward the continent’s rising stars where guns once failed.